Finding the right rug for a room is not an easy task; colour, design, materials, cost and suitability for the space all have a bearing when purchasing a rug. Our team is passionate about handmade rugs and has the knowledge and expertise to assess the space in your home and offer advice and style suggestions. Following the consultation a suitable collection of rugs are sourced and brought to your home to try in situ. Please contact us to book an appointment. Visualising our rugs with their beautiful array of colours, textures and designs, in your own home can be a difficult task. A rug can create many effects and dramatically changes the look and mood of a room, so checking the colour, pattern and size in situ is the best way to ensure it is right for your space. This is why we offer our ‘try-at home’ service as only when living with a rug can you make that final decision. If you are undecided in the showroom or have seen rugs on our website, please let us know and we will be happy for you to take the rugs to try at home. No matter how many rugs we have in stock sometimes our customers want something out of the ordinary – be it an unusual colour or an extra-long runner. With over 25 years of sourcing rugs our experience, expertise and extensive network of valued suppliers and contacts around the globe allows us to be confident that we can find almost any type of rug. Do contact us if you are looking for something in particular and we will do our very best to find that special piece. With over 25 years of experience within the rug industry we have established good working relationships with our suppliers. We work in partnership with numerous importers of hand-woven rugs and carpets, each with their own specialisms, and all of whom showcase their impressive quantities of exclusive and decorative pieces in vast warehouses. This relationship allows us access to the largest variety of traditional, antique and contemporary rugs in the UK. Although we stock a broad range of designs and sizes, sometimes you need a rug tailored to your own space in a particular style or colour. Our bespoke service allows you to adapt an existing design or even create something entirely new. We attract commissions from interior designers, architects, corporate businesses as well as private clients. The Rug & Carpet Studio works with a wide range of clients which include interior designers, architects and individuals and cover a wide variety of spaces from grand listed buildings to modern city apartments, period houses and English country cottages. With our specialist knowledge and our understanding of traditional rug artisanship, we are able to select the most desirable handmade rugs and carpets, hand-picked for their beauty and originality. 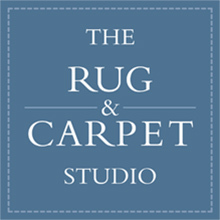 A leading centre of excellence in the care of handmade rugs and carpets, The Rug & Carpet Studio is one of the few places in the U.K. with the specialist skills to offer a full range of services. As a company renowned for its expertise within the rug industry, we are frequently asked to provide formal written valuations. Whether you have inherited a family heirloom, own an investment piece or simply require a professional valuation for insurance purposes or probate, we provide a specialist valuation service. Our valuation will include full details of the origin of your rug, its date of manufacture, its size and a full description detailing any special features or materials used in its construction. We will include its current value. We also offer owners of historic houses, museums and private collections, a complete valuation, cataloguing and historical research service. Our passion and expertise for oriental rugs means we are much in demand from national charities, societies and interior designers to deliver illustrated lectures in a whole range of topics from the art of oriental rug making, the history of oriental rugs, through to room design. We also share information within the profession and educate the public by lecturing on carpet care, history and conservation treatment. The conservators run study days at the workshops to increase public awareness in the field of conservation. Using the correct underlay is paramount to the longevity of your rug or carpet. Underlay will avoid premature wear and prevent your rug rucking, creeping or slipping, which is not only a trip hazard but can cause damage to your rug. We supply two types of underlay to rectify this problem.